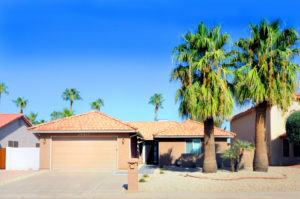 Sun Lakes Community Home Available - 26413 S. Brentwood Dr.
You are here: Home / Chandler AZ Real Estate / Sun Lakes Community Home Available – 26413 S. Brentwood Dr.
Sun Lakes Community Home Available – 26413 S. Brentwood Dr. If you want to join the active adults in the Sun Lakes Community, now is your chance. We are listing this home with a TOTAL RENOVATION in 2016 from top to bottom! This 2 bedroom, 1.75 bath is all brand new and move-in ready. The walls were moved to create an open Great Room concept with neutral, gray-tone tile flooring throughout. 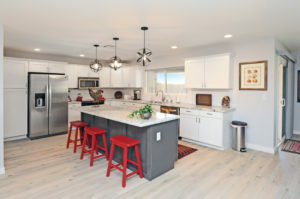 You’ll love the great kitchen with an island, granite, white cabinets, and stainless appliances. The laundry has attached storage cabinets and a brand new washer/dryer that convey. And when you get ready for bed, the spacious master suite offers plush carpeting, a large walk-in closet with a 3/4 bath, granite counters, new sinks, faucets, mirrors, and dual vanities. The oversized garage has room for a golf cart and a custom-built workbench! 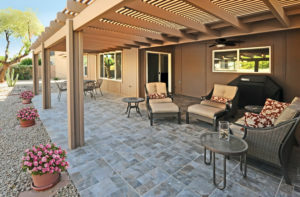 The landscaped backyard with extended tile and a covered patio provide a fantastic area for entertaining or just relaxing. In addition, there are NEW plantation shutters and blinds throughout, a NEW security door at the front entry, NEW RO, and SOFT WATER. Plus, you can enjoy all of the amenities Cottonwood Country Club has to offer including: golf, tennis, a heated pool and spa, a workout facility, a clubhouse/rec room, biking/walking paths, and more! This is a MUST SEE… especially if you want to be part of the Sun Lakes Community at Cottonwood Country Club!